Can I Eat Fish Eggs While Nursing? During pregnancy and lactation, the foods you eat can affect your baby's development, making it crucial to fill your menu with nutritious, low-toxin foods. Due to the high mercury content in some seafood, certain fish and shellfish are best avoided when you're nursing. Some forms of fish eggs, however, can be a safe and healthy option for nourishing both your own body and your child's. Fish eggs, also known as roe, are eggs taken from the ovarian membrane of female fish, such as trout, salmon, herring or vendace. 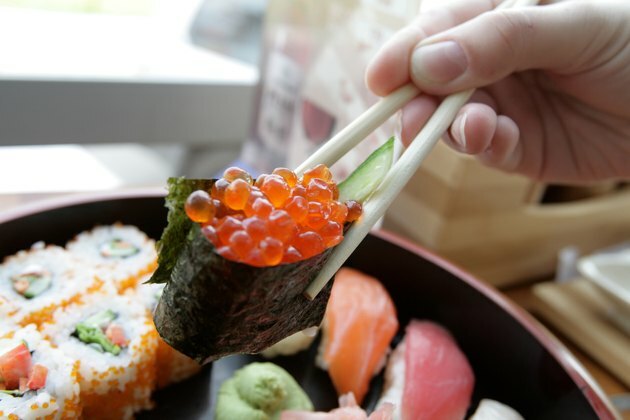 Although fish eggs can vary in size and color, they are generally rich in fat and tend to be highly perishable. Some fish eggs are considered a delicacy and boast a high price tag, such as caviar, which is made from the salted eggs of the sturgeon. Fish eggs are safe to consume while you are pregnant or nursing as long as they've been thoroughly cooked or pasteurized. According to Kimberley A. Tessmer, a dietitian at Pregnancy.org, unpasteurized fish eggs -- particularly ones cured with brine -- can breed foodborne pathogens such as listeria, which can be harmful to you and your baby. Brands of fish eggs labeled "pasteurized" have been treated with high-temperature water baths or radio frequency pasteurization, which kills dangerous bacteria and makes the eggs safe for consumption. Fish eggs are nutritionally dense, offering a variety of vitamins, minerals and fats that are valuable for your child's development. One 3-ounce serving contains 2 grams of omega-3 fatty acids, which support your baby's brain growth and are involved in nerve development, the American Pregnancy Association says. Fish eggs also contain a spectrum of vitamins and minerals vital for health, including vitamin C, vitamin A, vitamin E, thiamin, riboflavin, folate, vitamin B-12, niacin, pantothenic acid, phosphorus, zinc and selenium. To minimize your risk of foodborne illness, avoid consuming fish eggs that aren't clearly marked as pasteurized or cooked, and avoid fish eggs that have been brined but not heat treated. Even after weaning your child, some fish eggs may still be dangerous when eaten raw. Freshwater fish such as pike, perch, ruff and burbot may be infected with the larvae of the broad fish tapeworm, which can cause diarrhea, dizziness, abdominal pain and anemia if ingested by humans. To ensure your post-natal diet provides everything necessary for your baby's development, consult your physician or contact a dietitian who specializes in pregnancy nutrition. Pregnancy.org: Is Caviar Safe During Pregnancy? What Are the Causes of a Fish Odor on a Baby?